It doesn’t happen often, but sometimes I amaze myself by getting out of bed. Alright so I get up most, if not all mornings (I’m suddenly reminded of a spectacularly bad bank holiday hangover last year), but even though I’m quite a morning person, the lure of the snooze button is great. However, some days I wake up before the alarm goes off, practically spring out of bed and just crack on with my run or whatever I’m supposed to be doing. This morning was one of those mornings – it saw me out of the door by 5.45 and rewarded by some of the best running that I’ve enjoyed recently. My plan was an out and back run/walk for 30 minutes. When I take photos on out and backs, I usually try to take my photos on the way back so I get a bit of consistency in my running rather than being all stop-start when I set off. Today I regretted that decision a little. 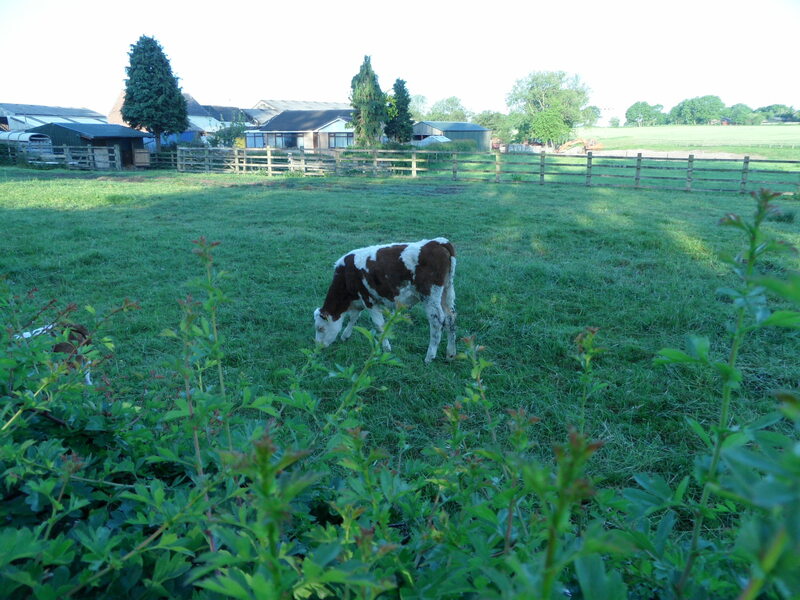 The calves that I’d spotted on the way out had conspired and decided to move from the middle of the wide open field and had huddled next to the hedge instead. A bit of clambering later and I managed to get one reasonable photo (and only some minor nettle stings on my shin). I reached the half hour mark just before home and felt ok in my legs, chest and belly so I carried on and rounded up to three miles. 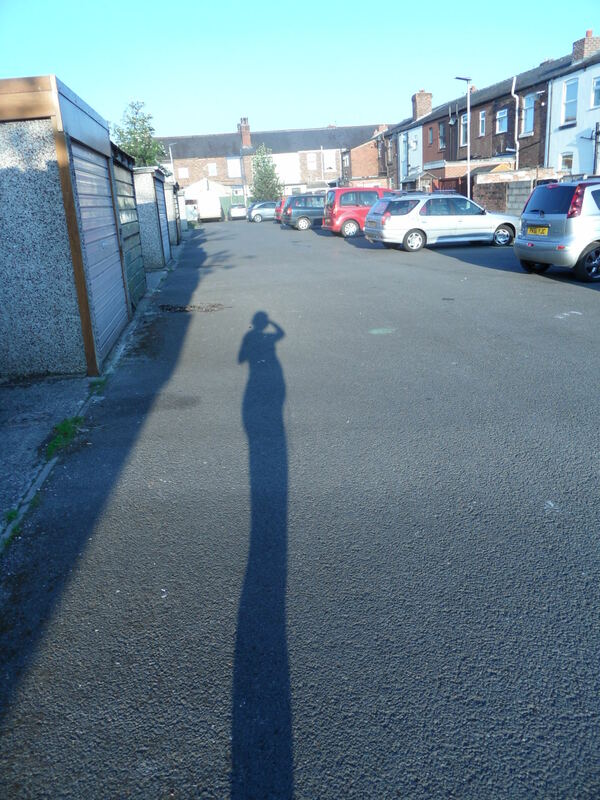 Oh, and I’m not really one for bump shots but, just as I do a double take every time I pass my reflection, my shadow took me a little by surprise this morning. 5.45? Ugh. Practice for the baby. Great photo of your shagow. Running, climbing, early rising and arty photographs. Is there no end to your talents today? Caught in my own post-delivery reality, it is only now that I read that you are pregnant. I am probably the last one to congratulate you but nevertheless: CONGRATS! Btw, I too was Athoning last year while carrying the tiny bean in my belly (not knowing), ran a 16k race while 18 weeks pregnant and actually continued running till week 28. It is a matter of taking your time, not pushing it at all and ignoring your family member’s remarks (especially mothers (in law) are really not supporting the idea of their pregnant daughters running…). In the last trimester, I had to calm down so did a lot of walking instead and now, 3 months after delivery, I ran my first 10k as a breast feeding mother. Challenging but doable. So take your time, enjoy the pregnancy and life and don’t push it :-). Good luck!